In February, I wrote about the Snowy Egret and its diet. (What's For Dinner? 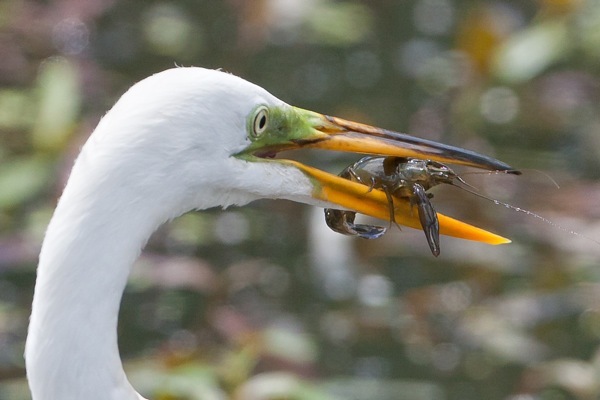 Snowy Egret) This month, I want to share my Great Egret photo and its crawfish meal. The Great Egret, also known as the Great White Egret is found in tropical and warmer regions of the world. It is actually a large Heron with solid white plumage. They are very much like the Snowy Egret with their diet and where they feed. They feed in shallow water and their diet consists mainly of frogs, fish and small mammals. They sometimes prey on small size reptiles and insects. They use their long, sharp bill to spear some of their prey. As you can see from my photos, crawdads are also on their menu. Nice portret, wonderfull moment you''ve caught there, keep it up! La garza tiene buen gusto. A mí también me gustan los cangrejos, con arroz, como los preparamos en León, Spain.